After the amateurishly released Defeat CD-R, the young Luxembourgish record label Ashcan Records is back with its second output, the new and second full length CD by Dutch punk rockers Last To Go. Already the professionally designed digipak with nice cover drawing shows that we are entering a different world. Last To Go are four people in their early twenties, and they sound like a bunch of young people with enough broken dreams from their adolescence. Now there is angry and angry. Angry bad is senseless noise that you really don't want to listen to, but then there is also angry good, which means channelling your frustrations into creative ways. 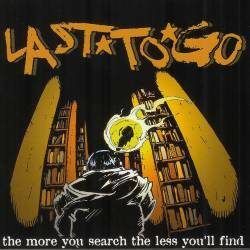 Last To Go belong to the latter category, and already the first two songs on the album show that they are walking the thin line between melodic punk rock and harsh street punk, pummelling through two-minute songs as if there were no tomorrow. Last To Go don't want to be labelled specifically, it's just punk rock and we like it. Little Devil comes with undistorted guitar and a ska rhythm, although the lack of a brass section keeps the song still this side of punk. Most songs are straightforward punk rock songs, sometimes hardly transcending the one-minute border, but they are also not afraid to play quieter, more melancholic tracks. At times I feel reminded of the early Rancid, as both bands concentrate on good song writing and have charismatic vocalists. Not only do Last To Go have above average intelligence lyrics, their singer also manages to bark them in a very dynamic way, joining street smartness with a good sense of keeping his wicked melodies. Last To Go have not reinvented punk (and even if, I doubt there is a patent on it), but they play their songs with such a conviction as only few bands come up with. After Luxembourg survived a flood of new bands, we are living in a time with record labels sprouting from the earth like mushrooms after rain. It's nice to see that they don't only exist to promote local bands, but also bring promising foreign music to Luxembourg. The More You Search, The Less You'll Find is an album every self-respecting punk should buy, 1. because it's a really cool album, 2. to support Last To Go and finally 3. to support the local label scene.